It’s my personal belief that most rooms look better with the addition of some greenery! It’s one of my favorite ways to add life to a space and it’s unlikely you’ll find a room in our house without some form of greenery. Faux greenery, flowers, and plants can be a hot topic in the design world. However, fake plants can be a great solution for many people, including those with a black thumb, those with pets, etc. Today I’m sharing my favorite sources for the best fake plants! I’m also offering tips on what to look for and when the best time is to buy from each of the retailers listed below. Fake greenery has gotten a bad rap in the past, because let’s be honest – there are some really bad options out there. 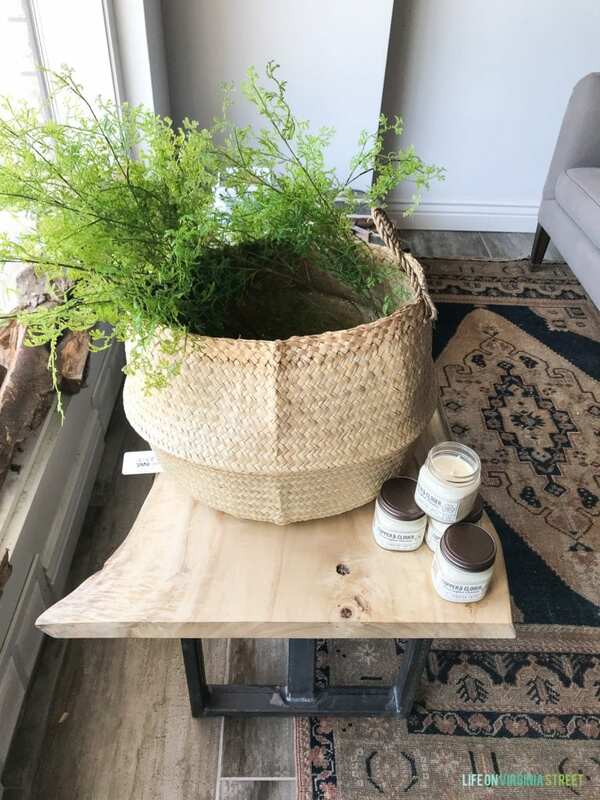 But, if you know what to look for, faux plants and flowers can look incredibly life-like without much maintenance or effort! Following are a few of my top tips on what to look for when buying fake plants. I prefer stems over pre-arranged plants already in vases. This allows you to use them in multiple ways and to arrange them the way you prefer them to look. With that being said, I look for stems with a more organic shape. Sometimes, the wilder the better. You don’t want it to look as though you placed a perfectly crafted piece of fake greenery into your vases and vessels. Look for bendable or wired stems so that you can arrange your fake plants to your liking. If buying online, be sure to read the reviews! If there are a large number, you can usually really upon the quality reports. This is particularly true on sites like Amazon and eBay. 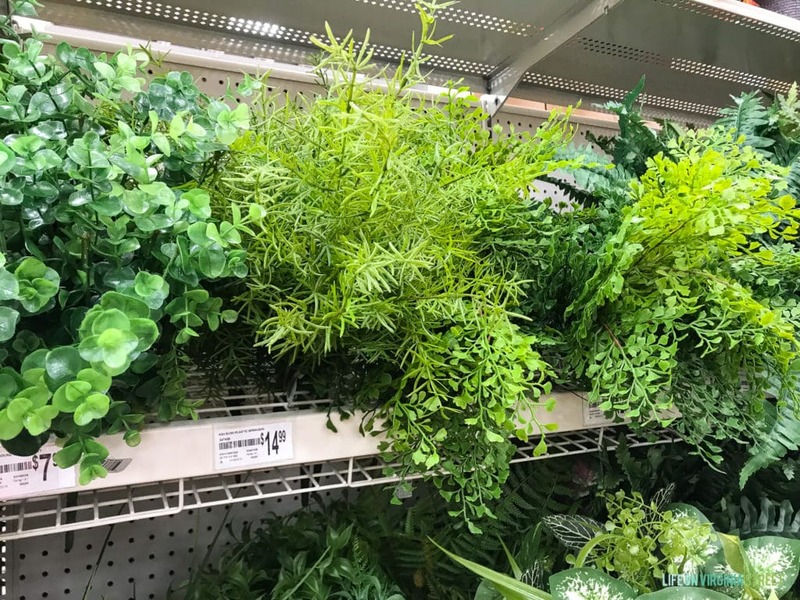 I’ve had the best success in buying realistic fake plants when I’ve looked for the following varieties: fig leaves, tropicals, maidenhair ferns, succulent varieties, boxwoods, natural greenery branches and stems and other fern varieties. The benefit to many of these is that even when real, they sometimes look fake. Most times, plastic plants look the most life-like. Especially when they have a foam element to them making them even feel realistic. Remember to keep them clean! Since fake plants are otherwise so low-maintenance, it may be easy to forget to dust them. Keep the surfaces clean so they not only last longer, but look more realistic! If buying silk varities, keep them away from direct sunlight or they may fade over time. 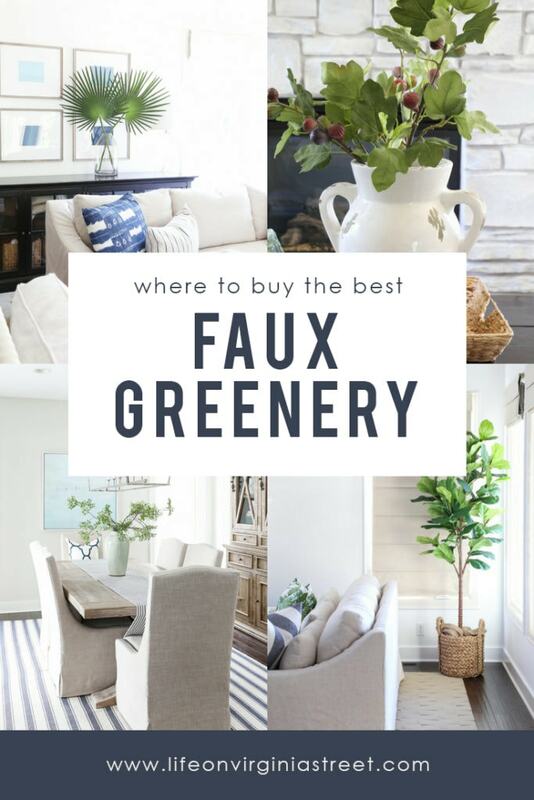 Following are my favorite sources for buying the best fake plants and what I buy at each store. Although it tends to be the priciest option, Pottery Barn is my favorite source for the best fake plants. From faux greenery stems and topiaries to fake flowers and fig trees, I’m rarely disappointed in the quality of Pottery Barn’s selection. Not only that, their stems are much more substantial than other retailers. So, you may only need three of their stems to fill a vases (vs. 6-10 from many other stores). However, I rarely pay full price for their items. They frequently offer 20% off discount codes, so I hold off on buying greenery staples until that time. You can shop all of their artificial plants here. 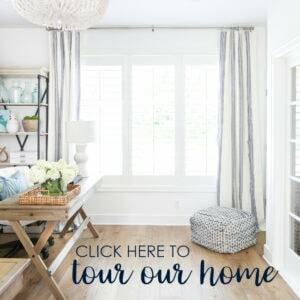 I’ve also included a few of my favorites from around our home below. 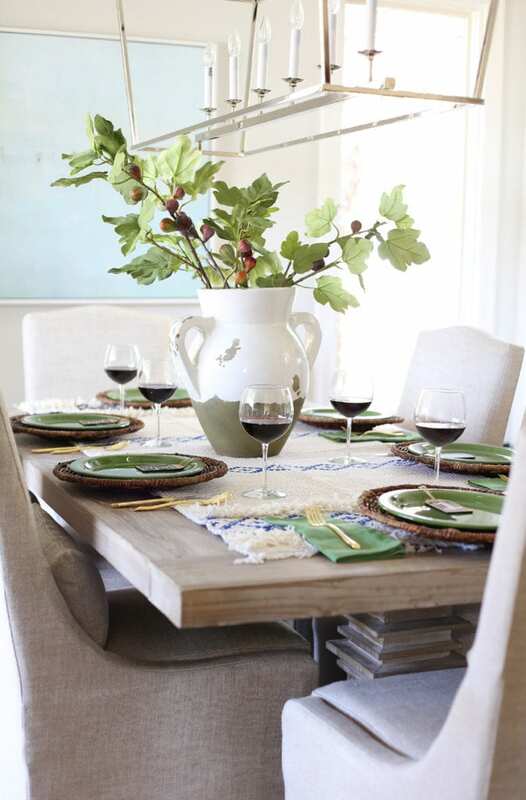 These faux green petal leaf branches have been a Pottery Barn staple for several years for good reason. They work in nearly every season, and have a great, organic element to them and can easily be shaped. In the vase below I have three branches. I have this faux fiddle leaf fig tree in both sizes. Out of the box, it doesn’t look great. But with some gentle leaf adjustments (they’re all wired) it looks beautiful! 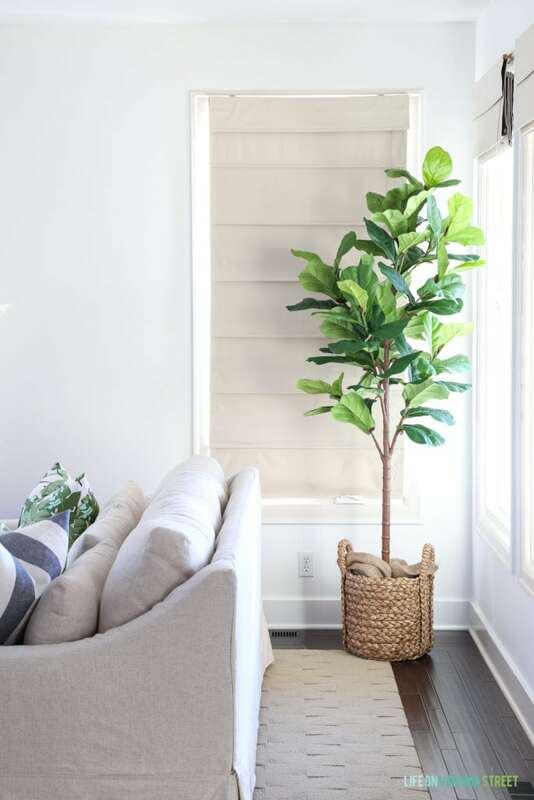 You can see my tips on styling and adjusting it in my post on the best faux fiddle leaf fig trees and styling tips. 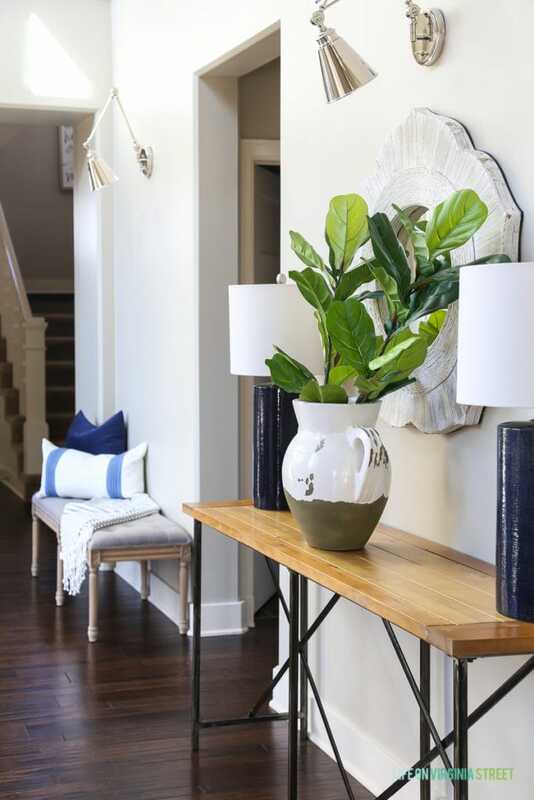 I was so happy to see Pottery Barn brought back these faux fig branches that I used several years ago! They’re beautiful for fall! Second to Pottery Barn, I feel like Hobby Lobby is my other go-to for the best faux greenery. I will never pay full price for theirs, as I feel like they go on sale every few weeks for 30-50% off! They also have arguably the most expansive selection of any chain store. 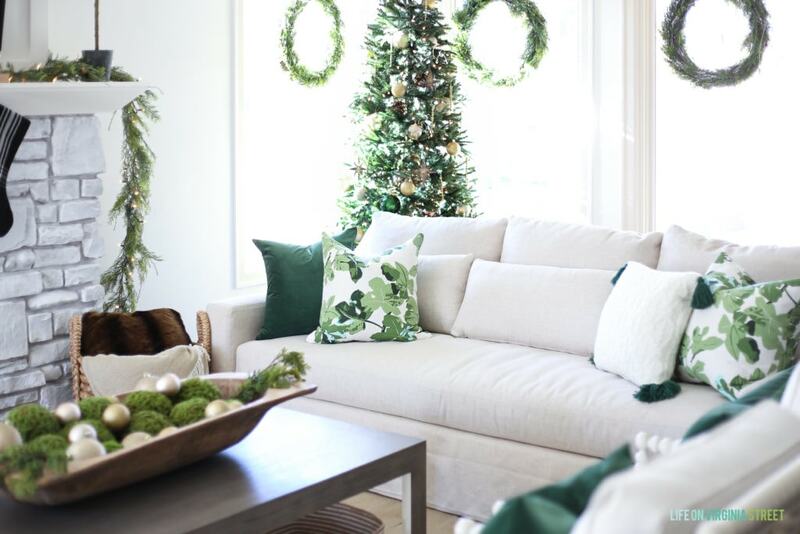 You can shop their faux greenery and foliage here. 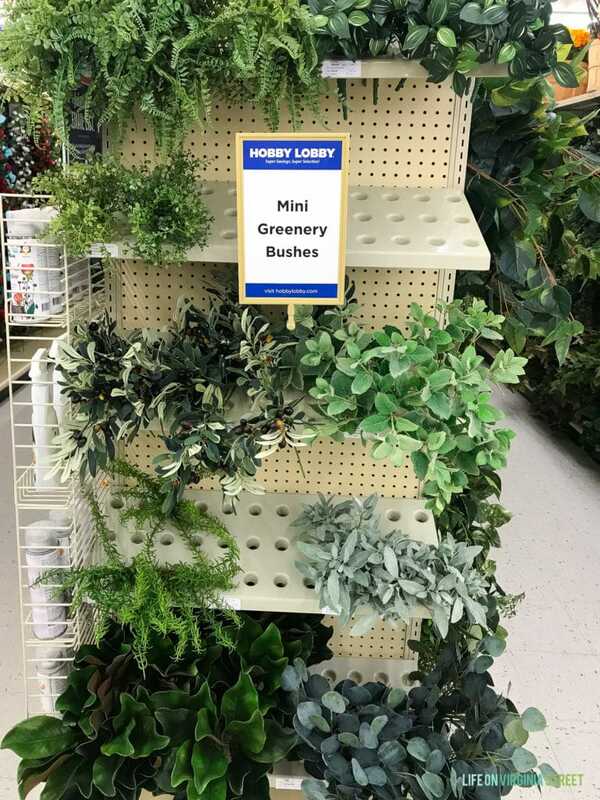 They also have a really beautiful selection of mini greenery bushes (near their greenery swags), although they tend to be much pricier than the stems shown above. I was super impressed with the olive leaf bundles I found their recently – and they’re currently half off! For the price, they are really beautiful and another pretty option for fall. 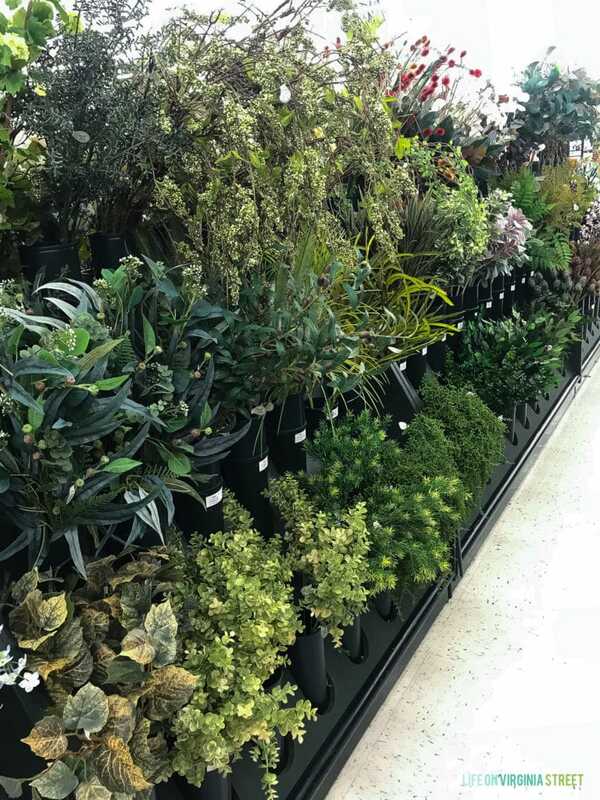 Michaels is another great local option for faux greenery, plants and flowers. They have a rather expansive selection both in stores and online. They also have a good selection of faux florals and I was especially impressed by their faux peonies and hydrangeas. You can see their current florals and faux greenery here. Another strong contender is Pier 1. They tend to stock basics as well as great seasonal options! It’s where I got our Christmas garland for our mantle last year and it looked so life-like! You can shop their faux floral and plants here. 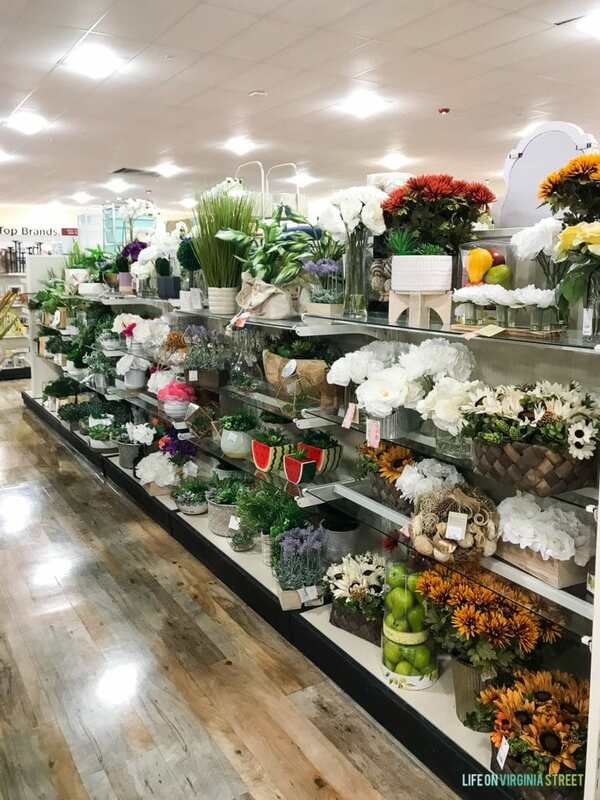 If you’re on the hunt for more of an “arranged” type plant or florals, HomeGoods is worth checking out. 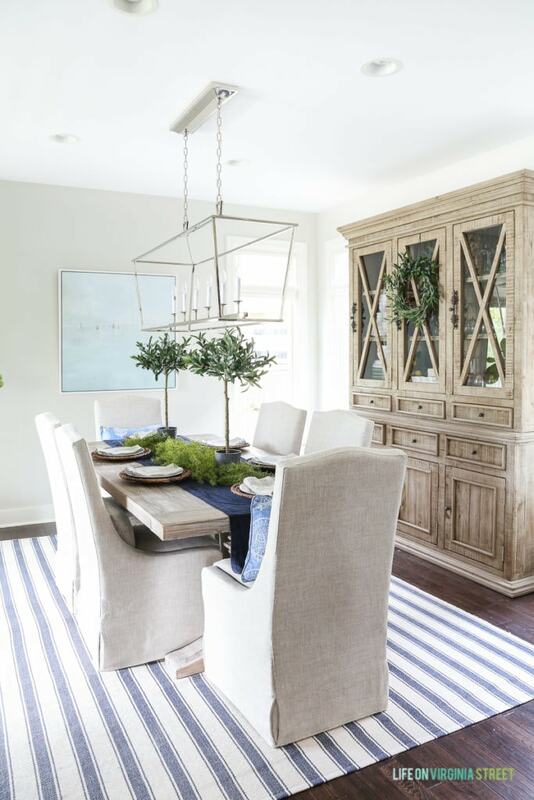 I’ve bought multiple preserved boxwoods from them in the past and even some faux versions that have worked well. You can also buy quite a few their artificial plants here (via the TJ Maxx website). I feel like West Elm tends to offer the best selection of tropicals and non-traditional fake greenery. I’ve had their faux fiddle leaf fig stems for years and still love them! They’re a bit more fabric-y than I would typically prefer, but the coloring on the leaves is life-like and I love that they are on wired stems, making them easier to arrange than most. Plus a few stems go a long ways with these. I have two in the large vase below. You can shop all of their faux botanicals and florals here. 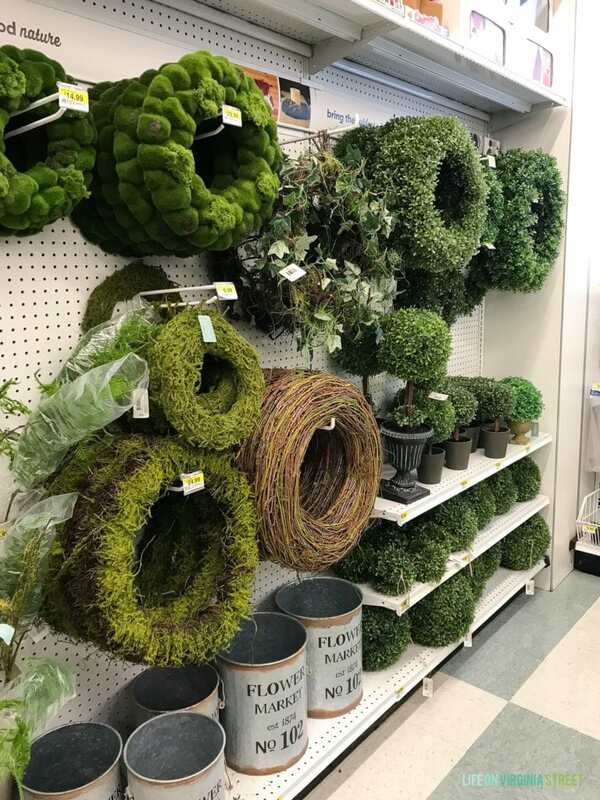 Although JOANN also has loose stems, I find they have a better selection of faux greenery in the wreath area. And they frequently have coupons you can use too! I’m a big fan of their mossy wreaths. World Market isn’t usually one of my go-to’s for greenery, but seasonally I feel like they can have some good options. Last year I felt they were the best sources for faux olive plants, like these topiaries and wreath I used in our fall dining room! And although I haven’t seen it personally, their faux fiddle leaf fig tree gets rave reviews too! You can shop their plant shop here. Be sure to also check local home decor boutiques. Many times their greenery isn’t much pricier than craft stores, and the quality can be better at times. Not only that, they usually give creative ideas for styling and displaying the greenery! I saw this pretty basket filled with faux stems when I was at Amethyst Home last week. So did I forget to cover any stores? Any other sources you love for finding the best fake plants? I’d love to hear! Hi. 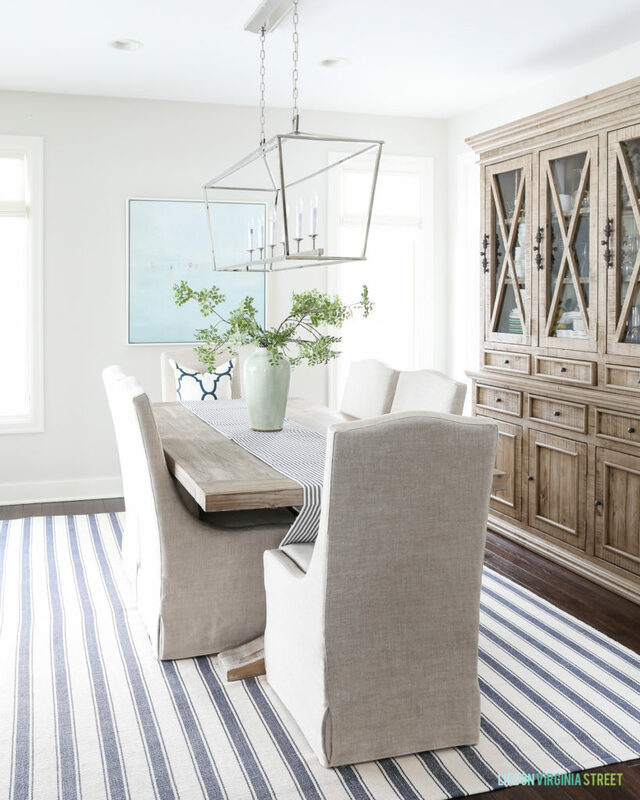 Where are ur dining chairs from? Great tips…I pinned to Pinterest. I recently bought some small realistic ferns from PB for a client to style her book shelves. Don’t have to worry about watering…just dusting. I have the Pottery Barn large fiddle leaf. I bought it online and it came very compacted together. Just how much can I bend the stems to make the tree fuller? In the local PB, I saw one with a broken stem so I am aprehensive about bending them too far. Pier One often has a great selection of reasonably priced, nice-looking stems. Yes! I totally forgot to include them but meant to. Thank you for the reminder so I can get them added. I love their selection too! 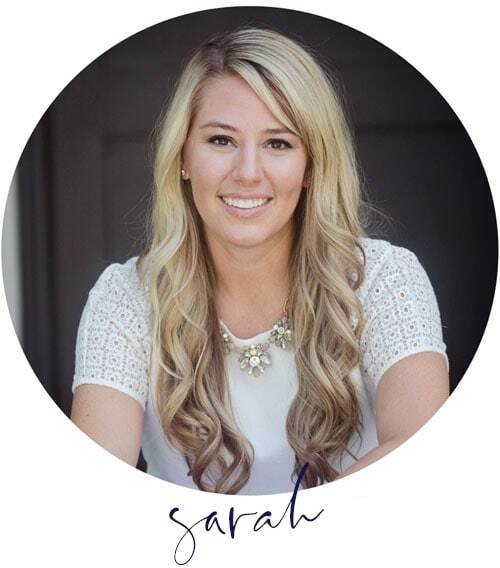 Great resource round up. I too agree with all of the places you listed. One place that I find a lot of great stuff is Pier1 Imports. I think most of my stems are from Pier1 – because I live in Canada and we don’t have Pottery Barn (major cities only), Hobby Lobby or World Market locally. Pier 1 is one of my favorites for faux greenery and floral stems! IKEA has the cutest mini pots of sculptural greenery.